Sometimes, it really feels as if things are not going right at all. It feels like things are getting worse and worse. This is the situation Liverpool is in. Liverpool has failed on their start dash this season mainly due tot he absence of goals, which do not match the number of chances. 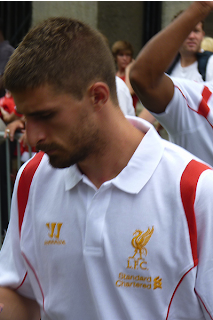 Liverpool only had Borini, Suarez and a few other young strikers, as Andy Carroll was loaned for West ham. It was quite easy to see, even for a elementary student, that if either one gets injured, it is game over for Liverpool. And like a nightmare, that did happen. Fabio Borini, who has been playing for almost every game this season, broke his right foot while out in international duty. When looking at comments from other liverpool fans on the internet I found that nearly half say that it won't make a difference because he has not proved useful, supported by the fact that Borini has yet to score his first premier league goal. However, I think that it will be a huge blow because although Borini hasn't scored, he has contributed to Liverpool attack and kept the formation 4-3-3. Now it is for young hopes such as Sterling, Suso (whose preferred positions are not strikers), Yesil and Dani to fill in Borini's gap.